13 oz Orlando Color Handle Mugs are one of our best selling ceramic coffee mugs. This 13 oz. cup has a unique shaped handle accented with a strip of color and a white body. 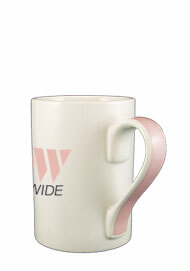 The ribbon like strip on the handle is available in a wide variety of colors. The printed cups are available factory direct at a huge savings. 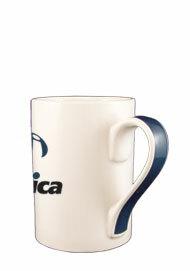 Have the personalized mugs imprinted with your logo. If you don't have camera ready artwork. don't worry. We have lots of free clip art and we also do simple typesetting for free. 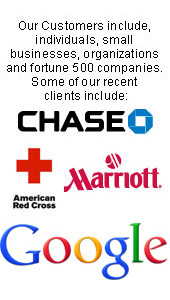 These advertising coffee cups allow you to promote your business at a fraction of the price. Use the mugs as a party favor and you're sure your guests will remember your event for a long time coming.